King’s Island Golf Club is a 36 hole golf resort in the outskirts of Hanoi and arguably the most scenic course in North Vietnam. 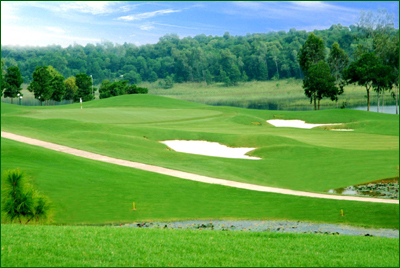 The golf resort lies on the shores of the Dong Mo reservoir 36 kilometers from Hanoi. At only 50 minutes drive from the capital, King’s Island is a high quality and convenient choice to include a North Vietnam golf package. In a uniquely Vietnamese touch, access to the course is by boat. Construction of two 18-hole courses began in 1993 and the first front nine of the Lakeside Course opened for play later that year. Then the course flooded, and the back nine was left unfinished until 1997. The second 18-hole Mountain Course was completed in 2004. The Lakeside Course spans two islands and a peninsula lying in the reservoir. Views are spectacular, with the majestic Ba Vi mountain range providing a stunning backdrop to the man-made lake, while the Red River Valley stretches into the distance. The Lakeside Course was designed by American Golf Course Architect, Robert McFarland, who has been involved in designing championship golf courses around the world. He specializes in challenging designs using local terrain and natural hazards. The Lakeside Course includes numerous and varied uses of the water surrounding the course and the gently sloping terrain. As might be expected, water plays a central role in the course design and comes into play on 13 of the 18 holes. Many of the hidden greens require accurate carries over the lake or swampy terrain. A favorite hole among players of the course is the par five thirteenth, with the tee shot having to clear a gorge. Also par five, the 572-yard seventh is another favorite, featuring a double dogleg from an elevated tee. Probably the most extraordinary hole is the fourteenth, the highest point on the course affording a spectacular view of Ba Vi Mountain. The Mountain course was designed by Pacific Coast Design Pty. Ltd. Based in Melbourne, Australia. Pacific Coast has completed major projects in India, Malaysia, China, Thailand & Australia. The design takes maximum advantage of the ambience of the waterside setting, distant mountains and surrounding trees. The layout of the golf course will excite and challenge all levels of players. 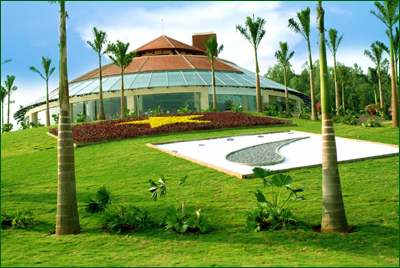 King’s Island Golf Resort and Country Club features a clubhouse with an excellent restaurant serving a wide range of cuisines. There is also a bar, which is a great place to relax at after your round. In addition to golf, the club also offers other activities including sailing and fishing on Dong Mo Lake and swimming in the club’s Olympic-sized swimming pool.